State comparison of income and broadband coverage. "A core mission of Broadband Now is accurate data. 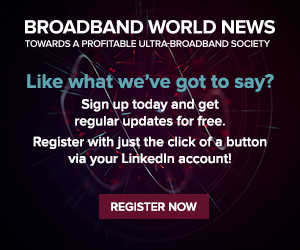 We believe by sharing that data we can foster more discussion, and hopefully foster more competition," said John Busby, managing director of BroadbandNow, in an interview with Broadband World News today. "There's a clear correlation between the number of providers that serve an area and competition." Ironically, despite fiber's relatively high cost of deployment -- with about 50% of expenses due to labor -- it is the least expensive technology powering subscribers' connections, according to Broadband Now research. Fiber has the lowest average price per Megabits per second (Mbit/s) ($0.48), followed by cable ($0.65) and DSL ($1.53). Whether they're digging trenches for fiber or deploying VDSL and Gfast modems, it doesn't make a difference for some regions: There simply is no competition and customers -- residential and small to midsize businesses -- must deal with one operator. That's the case across the entire state of Alaska -- the only state with zero access to a low-priced plan for any technology, according to Broadband Now. In fact, about 45% of the US population (around 146 million or the population of Russia) has no access to a low-priced residential fixed-access broadband offering, the data showed. Those with the least pay the most, on average. In states with median incomes of at least $60,000, 78% of the population has access to a low-priced Internet access plan on average, according to this report. 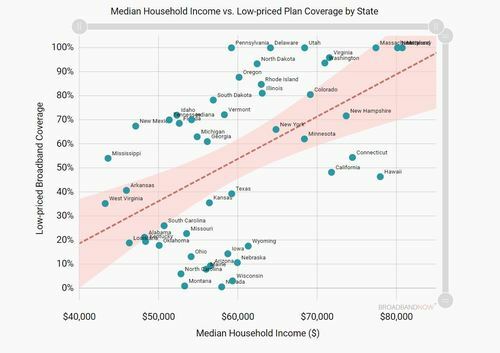 By contrast, in poorer states where the median incomes were less than $60,000, only 37% could buy a low-priced Internet plan. People who live in those zip codes representing the 10% lowest populated areas pay up to 37% more on average for residential wired broadband than those residing in the 10% highest populated areas, wrote Broadband Now. With the billions of taxpayer funds infused -- and rightfully so -- into rural communities to plug them into the Internet age, let's see when a reckoning of that data gets added to Broadband Now's mix. Insight into the multiple rural spending grants and low-cost loans coupled with a legitimate picture of what broadband tech truly is installed where is what the country needs, not only as an accounting that any responsible agency provides to stakeholders. But also due to the vital role fiber plays in 5G and the expectation of 5G's importance to the future economy of the United States. If the country doesn't know where all its fiber is deployed or inaccurately believes it's buried hither and yon (and it's not), then how can we compete in 5G? My fear: We can't -- unless we get a move on and use tools like this, starting now.